Burlap often gets short shifted as a fabric. 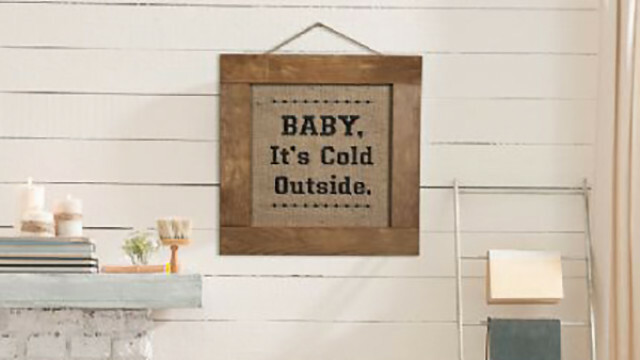 When beautifully stitched with embroidered lettering, though, it makes for a pretty and rustic piece. 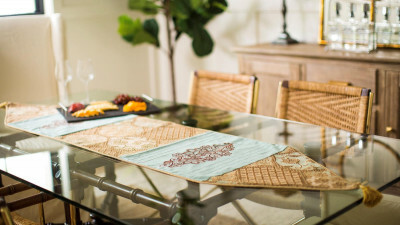 This embroidered burlap project can be completed in a short time and adds a touch of country charm to any room. Download printable instructions. Setup the machine for embroidery and click Embroidery category. Click on the font icon. From the list of fonts click on the third font as shown below. Before you type in the comma, select the number tab as shown below with the red arrow. To type in multiple lines, click on the Arrow key to advance to the next line. Use uppercase and lowercase letters for this line. Click on the Arrow key again to advance to the third line. Type in the word “Outside” using uppercase and lowercase lettering. Apply the Fusible Appliqué Stabilizer to the front side of a 16” x 16” section from the backing fabric, following the manufacturers’ directions. Remove the fabric from the stabilizer and place a 16” x 16” piece of the burlap fabric over the fused fabric and press to secure. This will give a solid background that will hold all of the stitches securely. Determine the center on the fabric sandwich and place a Positioning Sticker. Hoop the tear-away stabilizer in the 200mm x 200mm hoop and spray with the temporary spray adhesive. Place the burlap sandwich in the center of the hoop and finger press to secure. Embroider the design using black embroidery thread. Remove the embroidered section from the hoop. Setup the machine for sewing and change the embroidery foot with the Digital Dual Feed foot. Select a candlewicking stitch from the Decorative Stitches category. Using a Chalko marking pen to draw 2 lines; the first will be 1” above the first row of embroidered words, and the other 1” below the last line. 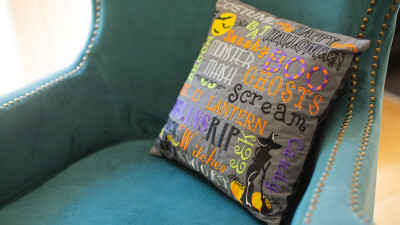 Stitch over the marked lines at a slow, even pace using the black embroidery thread. Keep the marked line positioned down the center of the presser foot. 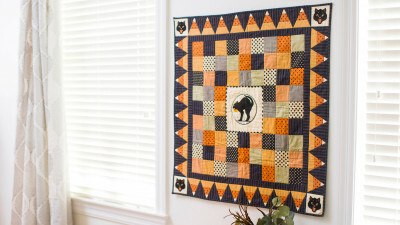 To frame the embroidery, place the embroidered fabric center over the mat. Pull the fabric to the back side of the mat and staple in place.